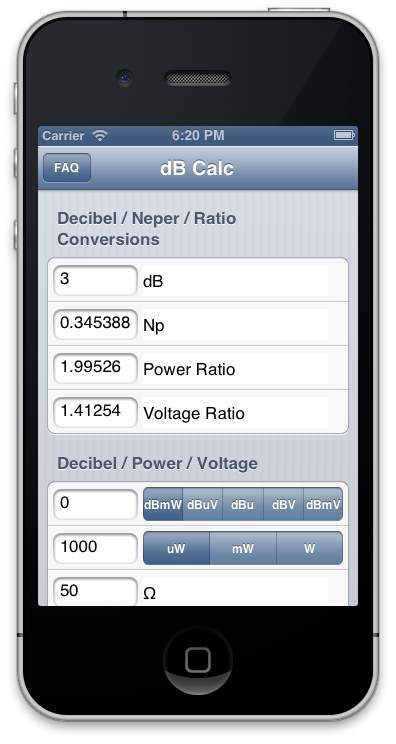 dB Calc performs several decibel related conversions. Enter in either the dB, Np (nepers), power or voltage ratio, and the other values will be calculated. Enter in the one known value, and the others will be calculated. Select the correct units before entering in the value. You can change the units of the displayed (calculated values) by selecting the new units. Enter in the resistance before entering in the known value.